Having been described as "langue mixte" (Lacroix 1971), this language presents features of Songhay and Berber languages. The observations discussed in this paper deal with the way voice changes are handled. In particular, it shows how the causative is formed. The causative morpheme S(V)- is of Berber origin and prefixed to the verb root as in Berber languages, whereas Songhay suffixes the causative morpheme that is of a very different form (-andi). But only verb roots that are also etymologically from Berber can take the morpheme in Tadaksahak. All roots that are cognates with Songhay are replaced with a Berber root with the same meaning, when causativized, changed to passive voice, or made reflexive or reciprocal. An appendix to the paper lists examples of both intransitive and transitive verbs using suppletion of the root when changed to causative and passive voice. Three distinct relativization strategies are used in Tadaksahak: a relative pronoun strategy, a gap strategy, and one that uses the morpheme sa (hereafter, the sa-strategy). One parameter that distinguishes these strategies is whether the relative clause is restrictive (relative pronoun and gap strategies) or nonrestrictive (sa-strategy); this difference is reviewed in section 1. The parameter that usually distinguishes the two restrictive strategies is whether the referent of the head noun is definite (relative pronoun strategy-sec. 3.1) or indefinite (gap strategy-sec. 3.2). Section 4 is devoted to the sa-strategy. 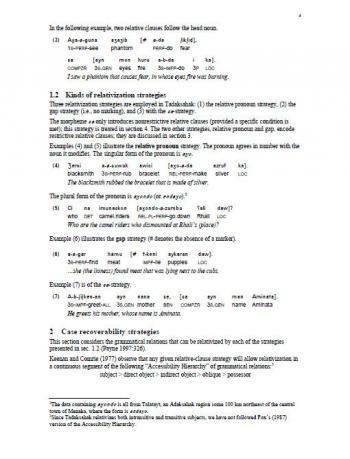 The paper also discusses which grammatical relations can be relativized by each strategy (sec. 2), and some motivations for left-dislocating nominal constituents that contain relative clauses (sec. 5). Inherent intelligibility between Tadaksahak (Dausahaq), Tasawaq (Ingelsi), Tagdal and Tabarog was measured using the Recorded Text Test developed by the Summer Institute of Linguistics. Language attitudes of the speakers of the Northern Songhay varieties in Niger were also investigated using group interview schedules and by observation.